Amy Schumer is not laughing and she's not cracking jokes today. 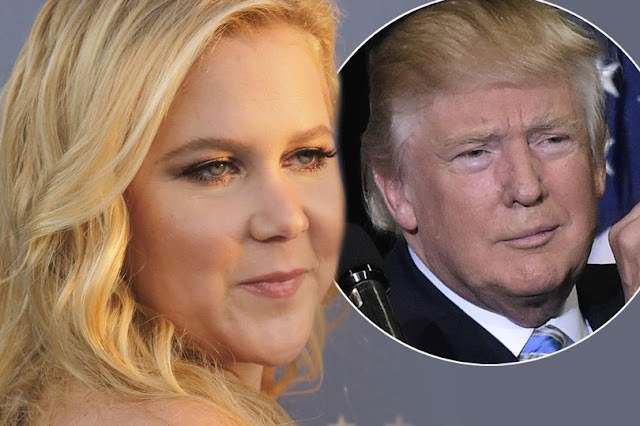 Following the election of Donald Trump as the next President, who beat Hillary Clinton , Amy has now furiously slammed anyone joking or trying to leave America. The star, who joked about moving to Spain if Trump was president, compares those joking about it now that Trump has been elected to those that actually voted for the President-elect. In a lengthy and thought-provoking Instagram post, Amy wrote: “First of all the interview where I said I would move was in London and was said in jest. Not that anyone needs more than a headline to count something as official news. Schumer also took aim at Trump voters, claiming they were ignorant for accusing Clinton of wrongdoing over her emails. “You say lock her up and you know something about the word email but what was in the emails?You have no clue. Well I’ll tell you if you were able to read this far through the holes in your sheet. They said nothing incriminating. Nothing,” she said. She also took aim at Trump himself, referring to the several allegations of sexual misconduct by women who came forward during the election season.